International opera star and Loyola University New Orleans alumnus Bryan Hymel ‘01 will return to his roots to celebrate the release of his debut CD. Hymel, one of the opera world’s fastest rising stars, will release “Héroïque,” his first solo studio recording, at an event to be held Sunday, March 1, at 3 p.m. at Loyola's Nunemaker Auditorium. The New Orleans-born tenor will sing selections from the recording as well as speak about his experiences making the CD of 19 French dramatic selections. The event is free and open to the public. Hymel will sign copies of “Héroïque,” which will be available for purchase at the event. Hymel, who made his Metropolitan Opera debut in 2012 when he stepped in as a last-minute replacement in its production of “Les Troyens,” has been singing professionally since 1998, when he made his debut as the Philistine messenger in “Samson et Delila” with the New Orleans Opera. Now a highly sought-after recitalist and concert performer, Hymel has appeared in many of the world’s most accomplished opera houses and festivals. He won the Beverly Sills Award in 2012. 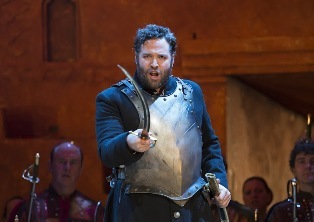 In 2013 he was the recipient of the Olivier Award for Outstanding Achievement in Opera for his trio of performances in “Les Troyens,” “Robert le diable” and “Rusalka” at London’s Royal Opera House. Hymel began the 2014-15 opera season at the Metropolitan Opera where he sang the role of Rodolfo in Franco Zeffirelli’s classic production of “La Bohème.” Hymel made his house and role debut as Percy in Lyric Opera of Chicago’s staging of “Anna Bolena” in December. He will reprise the role of Rodolfo in Dallas Opera’s production of “La Bohème” in March. Hymel’s summer season includes his house debut with San Francisco Opera where he performs his renowned rendition of Énée in “Les Troyens,” followed by his highly anticipated return to the Santa Fe Opera for performances of the Duke in Rigoletto. “He's doing amazing things," said Loyola voice professor Dreux Montegut, who taught Hymel and remains close to the star. "He's certainly one of our most successful music students. He's in great demand as a singer. He's performed at the most famous opera houses all over the world, and he's someone who stays close to us. He's a terrific ambassador for Loyola."